4. Francis A. Boyle, ”The Relevance of International Law to the “Paradox” of Nuclear Deterrence, Northwestern University Law Review, Vol.80,No.6, at1407, Summer 1986. Szczecin, Poland is one hour by car from Berlin’s Tegel Airport, and it is also a stone’s throw from the Baltic. This June the General Assembly of the International Association of Lawyers Against Nuclear Arms (IALANA) was held at the University of Szczecin. The current IALANA president is Justice C. G. Weeramantry, who is also the former vice-president of the International Court of Justice (ICJ). In the advisory opinion on the use of nuclear weapons, Weeramantry wrote a dissenting opinion that “the use or threat of use of nuclear weapons is illegal in any circumstances whatsoever.” He is already world-famous for this. Weeramantry’s argument firmly pushes aside the prevailing dichotomy that nuclear arms are different from the energy of nuclear reactors. 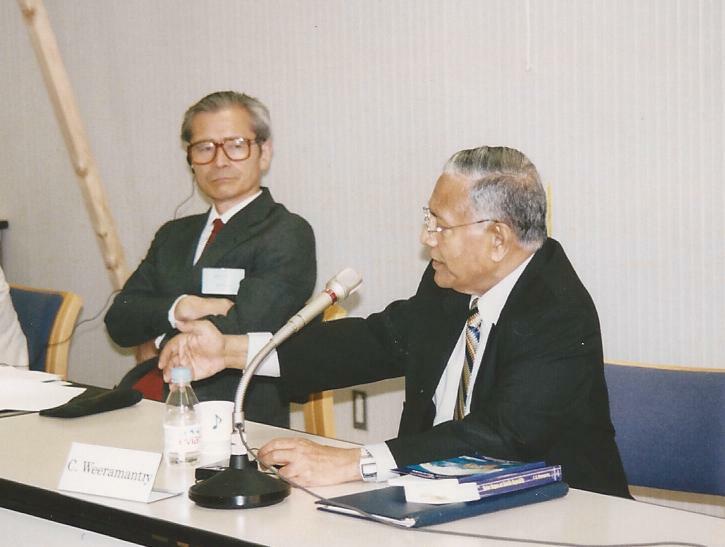 Weeramantry perceives nuclear weapons and nuclear energy — the two pillars of the nuclear age — as being connected, and calls upon people to squarely face the grave problems common to both. What should form the nucleus of our thinking in our approach to this situation called “from Hiroshima to Fukushima”? After considering this I concluded that it is the concept of the criminality of nuclear weapons and nuclear energy. But one cannot find the concept of nuclear energy criminality in Japan. For example, even the Japan Confederation of A- & H-Bomb Sufferers (Hidankyo) has appealed only to the criminality of nuclear weapons. His serious doubt is also directed at those who back the abstract proposition that nuclear deterrence is legal. He argues that the US doctrine of nuclear deterrence is illegal, and that its illegality has the effect of encouraging military antagonism by other countries. Weeramantry says that each citizen holds the environment in trust. In this respect, those in charge of nuclear power for governments have a special responsibility. The frightening consequences of nuclear power will bring catastrophic damage to future generations. But that’s not all. Even though photovoltaic power and other renewables can supply all the energy the world needs, these are to be ignored. Nuclear reactors are terrorist targets. Although the total amount of waste produced by nuclear reactors is immeasurable, there is no way to treat it safely. To continue and expand nuclear power while knowing these things is to continue violating the environmental trust, and to abandon our responsibility to our children and grandchildren. This cannot be justified in the light of any standards of morality or the law. Nuclear power violates all principles of humanitarian law, international law, environmental law, and also international law related to sustainable development. This means that unless government authorities take immediate action to stop the construction of new nuclear power plants, they are committing crimes against future generations while being aware of the danger. Weeramantry appealed to environmental ministers of all countries to take immediate action. I was deeply impressed by his view, and moved by his wisdom and courage. I myself advanced the argument that the continued existence and proliferation of nuclear power is also a crime against the current generation. (8) I submit that the Japanese government and Tokyo Electric have committed a grave attack against the human dignity of the general public living in the Fukushima area, thereby reducing their quality of life in the extreme and otherwise committing inhumane acts against them. Although they may try to exonerate themselves by claiming they had no such intent, intent is not a constitutive requisite to establish a crime against humanity. In that human dignity has been attacked, the suffering of those exposed to radiation in a nuclear accident qualitatively holds something in common with this hibakusha of Hiroshima and Nagasaki. Moreover, the number of nuclear accident victims is far higher — so high that even now it is uncertain. At Fukushima, low-dose exposure including internal exposure in reality threatens the lives, health, and safety of on-site workers, children, and regional residents. What is more, it is recognized that the harmful impacts of the radioactive substances emitted extend to the global environment including the atmosphere and oceans, lead to ecosystem damage, and impinge on the survival of humanity. Meanwhile, Boyle too was quick to point out the criminality of the nuclear power industry. His March 20 letter can be summed up as follows. Japan’s nuclear energy (nuclear power) industry continues crimes against humanity as defined by Article 7 of the Rome Statute of the International Criminal Court, of which Japan too is a party. The same can be said also for the nuclear energy (nuclear power) industries throughout the world, not just that of Japan. The people of Japan should use this legal conclusion to get Japan’s nuclear energy industry to stop its crimes against humanity. The same should be done for the nuclear energy (nuclear power) industries all over the world, not just that of Japan. MOX in particular contains plutonium, the deadliest substance known to humanity. Furthermore, Fukushima Daiichi’s unit 3 uses MOX/plutonium, and an explosion has already occurred there. Japan’s government should continue hitting the nuclear energy industry with demands for information disclosure. (9) This opinion gave me some ideas. IALANA’s June 19 Szczecin Declaration includes the following two elements: Bring about a start of preparatory work for the conclusion of a nuclear disarmament convention, and call for the worldwide abolition of nuclear energy. In relation to the second, IALANA took a resolution by the May 26 directors meeting of the Japan Association of Lawyers Against Nuclear Arms (JALANA) as a call to abolish nuclear energy, and supported it. The declaration also stated that what is needed is a complete switch to renewable energy and to democratizing energy production. Let’s take a retrospective look at the background and characteristics of this year’s General Assembly. The main point of the IALANA resolution adopted in June 2009 was the outlook on the Non-Proliferation Treaty (NPT) conference to follow in May 2010. It says that to make a reality of the future vision of a world without nuclear weapons, it is necessary to have a convention which would attain total and permanent nuclear disarmament. IALANA stated that it had expectations for demands from the NPT Review Conference to quickly start negotiations aimed at concluding such a convention. But IALANA saw this expectation as having ended in failure, and therefore decided that instead of gradualism, it would itself work toward a means to “make a leap” toward a world without nuclear weapons. At this point the dichotomy that “nuclear weapons are different from the nuclear energy that drives reactors” was still pervasive. But in response to the March 11 Fukushima Daiichi accident, IALANA was suddenly faced with the question of whether to conduct activities to bring about a world without nuclear energy. Also, April of this year was the 25th anniversary of the Chernobyl accident. I should mention in passing that the International Physicians for the Prevention of Nuclear War have issued a new critical opinion stating that the perception held the International Atomic Energy Agency and other parties underestimates accident damage. (10)IALANA also questions whether claims can be made for a clean energy revolution through the global proliferation of nuclear power. This brings the new achievements of this General Assembly into clear view: Twenty-three years from its founding, IALANA has advanced to the quest for peace from the abolition of nuclear arms, and has decided to position a worldwide nuclear power phaseout under these two objectives, and to tackle this challenge in its capacity as legal specialists. Seen from a different vantage point, one could say that IALANA has decided to see nuclear disarmament, nuclear power phaseout, and the quest for peace as a trinity, and to work toward achieving it. When we become aware of this stance and tackle the challenge of phasing out nuclear power in our capacity as legal specialists, there are any number of examples. There is the legal system under nuclear power treaties, with the Statute of the International Atomic Energy Agency at its pinnacle. In Japan there is the legal system under the Atomic Energy Basic Law. So what approach should be taken? For example, how do we deal with the “inalienable right” granted under Article IV of the NPT? The current treaty text establishes “the inalienable right of all the Parties to the Treaty to develop research, production and use of nuclear energy for peaceful purposes.” Therefore we should address the situation by assuming this can be changed. Even if nearly all UN members are parties to the NPT, action is taken in line with the procedures for international legislation. If these efforts conform to the advance of the renewable energy revolution, a solid outlook will present itself. 1.IALANA, Schützenstr. 6a, 10117, Berlin, Germany. Final Declaration of the General Assembly of IALANA, Szczecin, 19th of June 2011 (http://ialana.net/uploads/media/Szczecin_Final_DeclarationVers.4_01.pdf). 2.Francis A.Boyle, “The Criminality of Nuclear Deterrence.” This article is the record of an address delivered on September 4, 2010 at a conference in Feldkirch, Austria. The conference was the XVIIIth Conference “Mut Zur Ethic”: Direct Democracy. 3.Francis A. Boyle, “The Relevance of International Law to the ‘Paradox’ of Nuclear Deterrence,” Northwestern University Law Review, Vol. 80, No. 6, pp. 1407ff, Summer 1986. 7.“Nuclear Reactor Catastrophe in Japan” (Translated by Kenji Urata), Nihon no Kagakusha, July 2011 (in Japanese). 8.Kenji Urata, “Nuclear Power Accidents: Nuclear Power and Nuclear Weapons Present the Same Threat,” a “Word from the Wise” column distributed by Kyodo News in newspapers including the Akita Sakigake (June 10) and Shinano Mainichi Shimbun (June 22) (in Japanese). 9.Nuclear Power Industry Is a Crime Against Humanity! Sunday, 20 March 2011, 09:11. 10.The surprising difference between the IPPNW’s new report “Health effects of Chernobyl” and the document “A Comparison with the Chernobyl Accident” from the Japan Prime Minister’s Office. Peace Philosophy Centre (http://peacephilosophy.blogspot.com/), April 18, 2011. This article is published at the website of Peace and Conflict Monitor by UN University for Peace, October 05, 2011.